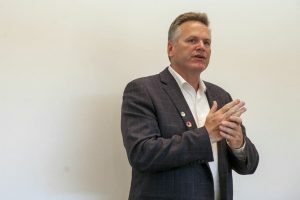 Governor Mike Dunleavy says Alaska’s budget deficit requires dramatic cuts to state services and he wants it done in one year. The Governor says he wants a permanent fiscal plan for Alaska and he has proposed amendments to the constitution to keep future governors and lawmakers from changing the tax structure or the PFD formula without a vote of the people. Governor Dunleavy makes the case for his goals for the future on the next Talk of Alaska. LIVE Broadcast: Tuesday, March 26, 2019 at 10:00 a.m. on APRN stations statewide. LIVE Web stream: Click here to stream.